Over the past few months, school personnel have worked together to review the district’s performance in the areas of leadership, learning, and resource capacity. This review is part of a process whereby the District will have an outside organization, AdvancED, review our overall programs and help identify areas where things are going well and also areas for improvement. This information will guide the District as we develop the next version of our strategic plan. 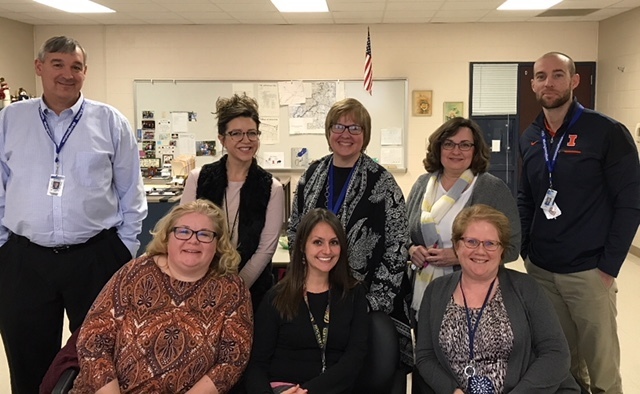 The Blue Ridge District Steering Committee (pictured) met on Tuesday, January 9, 2018 with Dr. Lori Hopkins, Director of AdvancED to go over the feedback from school personnel. Dr. Hopkins discussed the findings with the committee and toured the Farmer City campus. She will provide a report in the next month or so. This document will guide us as we develop our next strategic plan and prepare for a full accreditation visit from the AdvancED team sometime within the next 2 years. The full accreditation visit will gather information from parents, community members and other stakeholders, in addition to school personnel.